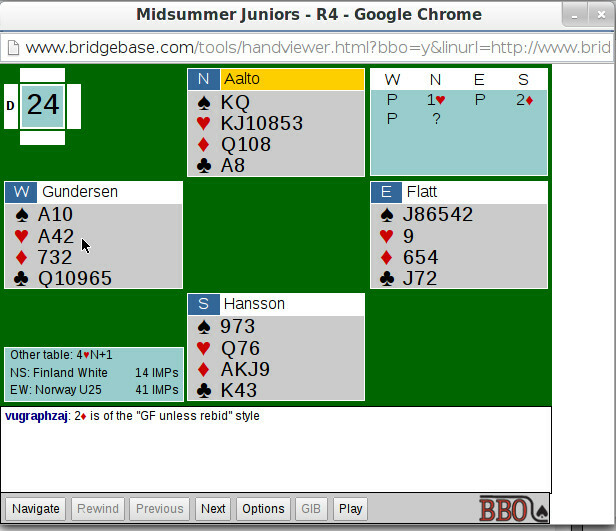 Bridge Base Online (BBO) is unique by the fact that not only can players choose from many different options to play, they can also *in real time* watch the highest levels of bridge play from around the world. Although many of us would have liked to kibitz the finals of, say, a Bermuda Bowl, in the past we have had to be satisfied with after the fact content. But on BBO, with our Vugraph availability, you can watch all the major matches, no matter where in the world they are happening, as they are played, card by card. And there are choices even there. You can watch the happenings in the 'Open Room' and then quickly jump to the 'Closed Room' and see how the same hand is played at that table. As an added attraction, commentary from World Class players is provided for each match. This interesting commentary by bridge stars gives a behind the scenes ongoing picture of what is happening at the table. What will the player do next? What should he have done? What effect is that *one* play going to have on the total match? Which player is thinking, yawning, questioning, leaving the table to stretch, making a joke, frowning, or looking to the heavens for help? Our entertaining commentators keep the viewing audience up to date on everything that is happening at the playing area. 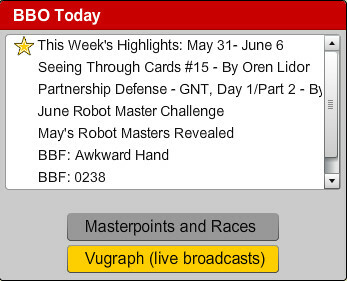 A schedule of current and upcoming Vugraphs can be found by clicking on Vugraph (live broadcasts) under the BBO Today heading. This page will also show you any Vugraphs currently in progress. These are clearly shown by the event name, which segment currently being played, whether it's the open or closed room, the team name and the players at each table. When you find the one you want to watch, simply click on the Join button and there you are. Click the Vugraph Schedule button on the bottom right hand side of your screen under the tables being broadcast as Vugraph. This page will show you a list of the upcoming Vugraphs adjusted for your own time zone. Vugraph broadcasts in progress on the list will be highlighted in yellow. Missed a Vugraph broadcast? 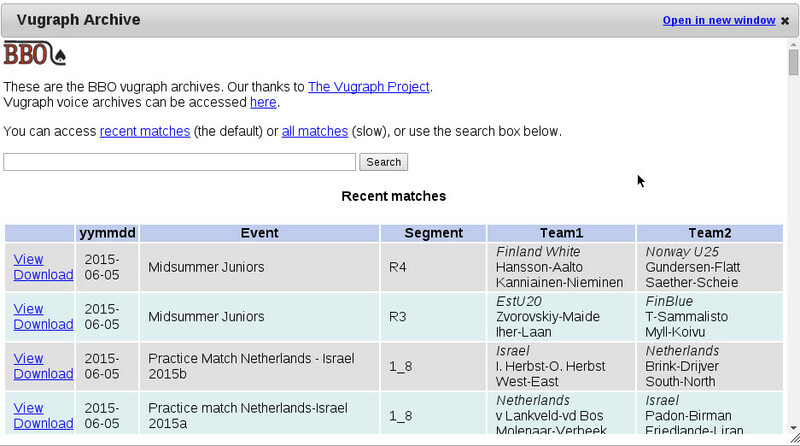 Click the Vugraph Archive link right next to the Vugraph Schedule link. You can View or Download the archive to your computer. For example, click View and see the list of boards played during that segment. Choose the board you wish to review by highlighting it and clicking your right mouse button. The board and vugraph commentary will be shown in a popup window. To scroll through the bidding and play of the hand use the Next button.